Eminem is the final headliner confirmed for the 2017 Reading and Leeds Festivals. The 'Lose Yourself' rap superstar has been announced to perform at the annual event, which takes place on the weekend of August 25 - 27 at Richfield Avenue, Reading, and Bramham Park, Leeds. He joins headliners Muse and Kasabian for his what will be his first appearance at the music extravaganza in four years on August 26 at Reading and Sunday 27 at Leeds. 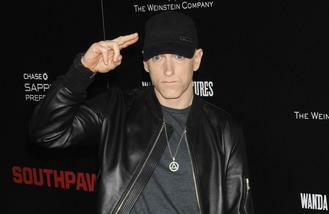 Reading and Leeds boss Melvin Benn said: "Eminem returning to Reading and Leeds is beyond exciting. "His 2013 headline performance was incredible and I can't wait to have him back. In addition to our third and final headliner - joining Kasabian and Muse - we've announced over 70 additional acts to this year's line up - It's looking stronger than ever." Also joining the line up are Charli XCX, Blossoms, You Me At Six, The Pretty Reckless, Mallory Knox, Frank Carter & The Rattlesnakes and Becky Hill, plus many more. They join previously announced acts including Major Lazer, Bastille, Architects, Glass Animals, While She Sleeps, Two Door Cinema Club, Never Be Like You' hitmaker Flume, Wiley, Circa Waves, Jimmy Eat World, The Amity Affliction and Rat Boy. It has been five years since 'Shoot The Runner' rockers Kasabian played the festivals. On their headline slot, they said: "It's been five years, and as a band we have come a long way since then. We're looking forward to playing tunes from the new record and bringing the mosh pit to Reading & Leeds Festival!" And Muse haven't played in six years. They said: "We're very excited to be playing Reading and Leeds again. More news about our plans for 2017 coming in the new year." Future has promised his new album is "super personal". Natalie Imbruglia has announced a 2017 acoustic tour. Singer Kay Cola has claimed she heard Chris Brown "beating" his then-girlfriend Karrueche Tran while living as their neighbour. The Weeknd, Chance the Rapper and Skepta will headline Wireless Festival 2017. Beyoncé will reportedly drop her new album in April. Adele gushed about her amazing year as she accepted the Global Success gong at the BRIT Awards on Wednesday night (22Feb17). Jay Z is set to become the first rapper to be inducted into the Songwriters Hall of Fame. Matt Willis will miss his wife Emma presenting the BRIT Awards tonight (22.02.17).